The bugs in this game are anything but creepy. You will learn to love their cute smiling faces as they help you build your bankroll. This Novomatic Casino game has a brilliant setup and features 20 pay lines to give you plenty of ways to win. There are five reels and three rows. Although there is no progressive jackpot, you have the chance to win big with bonuses and the gambling feature. If you like gardens and bugs as themes, you may also like Beetle Mania Deluxe or Fruit Farm. This game has an uncomplicated design with brightly coloured animated bees and bugs. Their big googly eyes are always watching you from the reels or behind them. There is a gradient green background. The game runs smoothly and has larger print to make the numbers on the bet boxes and credit screen clearer. You can play Bugs N' Bees on most mobile or PC browsers. With a wide range of betting options in this game, you can make the stakes low or high. The arrows on the line box let you pick how many lines to bet on, and the arrows on the bet box let you place a coin value per line. The two numbers are multiplied to make your per-round bet number. For example, if you bet five coins per line and bet on 10 lines, your bet will be 50 coins per round. The minimum bet per line is .02 coins, and the maximum bet is five coins. This makes the maximum bet per round 100 coins. If you have played Sizzling Hot Deluxe, you will recognize the gamble bonus game. When you spin a winning combination on a pay line, you have the option to collect it or gamble it. Gambling it gives you a 50 percent chance of doubling the win amount. If you win the gambling round, you can gamble again to double that win as well. You can gamble up to eight times. For example, imagine that you won 60 coins after spinning a winning combination. If you choose to gamble it and win, you win 120 coins. If you take a risk and gamble the 120 coins, you can win 240 coins. If you lose a gamble bonus game at any point, you lose the current win. To win at the gambling game, you must be quick and click a flashing bar when it is lit up. Open the paytable to view an expanded character list with all value increments. You can click the autoplay button if you want the reels to spin automatically. Click stop to exit autoplay. If you want to change your bet between rounds, simply use the plus or minus arrows on the bet and line boxes to do so. Turn the volume up or down by clicking the speaker icon at the top of the screen, and click the music note to turn the game sounds off. Click the expansion button at the top of the screen if you want to play the game in full-screen mode. You can hit the escape button on your computer or click the button again to exit. If you click the arrow button once, it doubles the spinning speed of the reels. 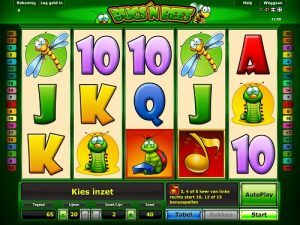 As it is with Orca, Hoffmania, Faust and other slots, you can play Bugs N' Bees in demo mode for free until you are ready to wager. If you want a faster pace and higher stakes, try electronic table games such as blackjack, baccarat, roulette and sic bo.